To book or not to book, that is my dilemma. I've been saving up my Mabuhay Miles for this! Last year, I used my miles with this promotion, went to Taipei and had a super awesome time for the same 7500 Miles! That's 50% of the original miles requirement to redeem flights!!! Sad face for the travel period. I'm already super booked. Anyhow, we all have until March 6, 2012 to think about it. This is a super promo for mileage collectors like me. I suggest you take advantage of the international roundtrip offerings. 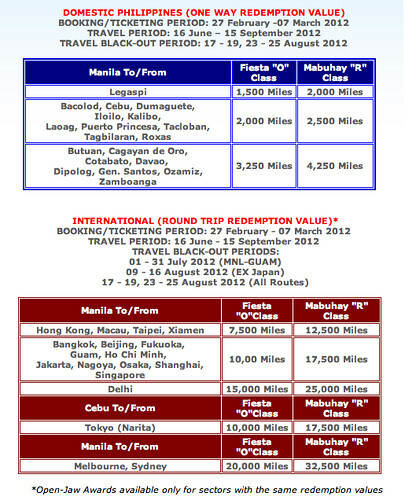 Click here to download the Philippine Airlines Mabuhay Miles Great Miles Getaway redemption form. Click here for more info on the redemption rules.